And, yet again, another pretty, young woman who looked like she had it all together on the outside, was dying inside, slowly killing herself with alcohol. A sad story, but a story worth telling – a story we need to hear. 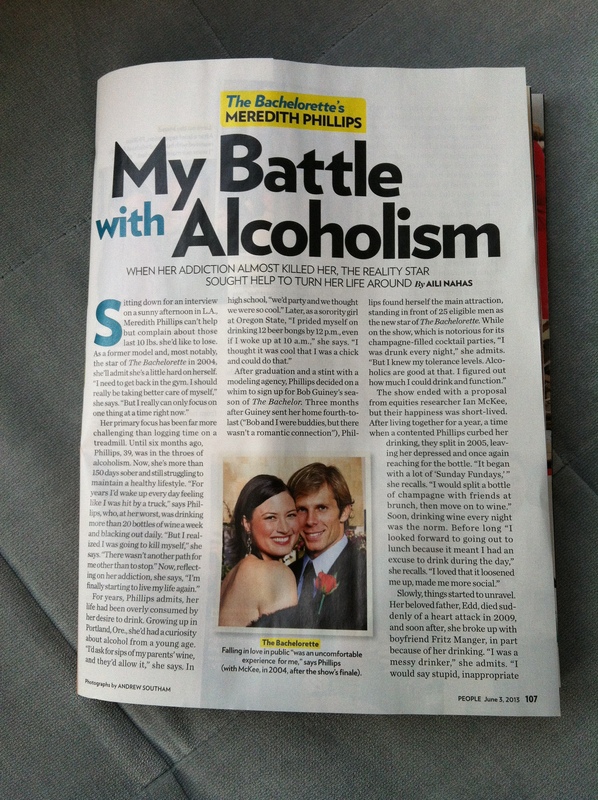 I don’t watch The Bachelorette, but I recognized Meredith Phillips picture as soon as I opened my recent issue of People magazine – one of my few guilty pleasures I still indulge in. I remembered her from the show years ago because she was from Portland, OR and had graduated from Oregon State, where I had recently finished my master’s degree. Her story is not “special” because she is a celebrity, but her story carries a certain power because people who viewed her as “the girl next door” now see her in a different light. Because, if alcoholism can touch her, there’s a very good chance it can touch all of us. I know there’s more celebrities like her out there, struggling with addiction and alcoholism. While each of us has our own personal journey, I wish more people like Meredith would share their stories and bring attention to this horrific disease. No, it’s not fun. In fact, at times it’s pretty hard. But, I’m grateful for people like Meredith who share their stories with the world and bring light to the struggles and miracles of getting sober. I haven’t heard of this young lady (ha ha – she’s only 3 years younger than me), but I am glad that she is telling her story. A lot better than hearing the flip side of these things – Amy Winehouse, Whitney Houston, etc. The guitarist from an elite metal band, Slayer (who I loved in high school) just died from alcoholism, straight up, the other week. No glossing over it – drank himself to death. So it’s refreshing to hear about those who have survived and are honest about it. It seems that I have been hearing a lot lately from sober / clean musicians and actors. It’s wonderful to see. It drives home what you mentioned – that “those” people don’t get ill. That is, those who seem to have it all…and celebrities are the epitome of having it all. But for many of them, they are broken and empty inside…like us “normal” drunks. No amount of fame or fortune can cover up what ails them…and booze and drugs do the deed…for a while. We are them and they are us. No difference. We just don’t get the paparazzi. Thanks, Paul. I remember hearing about that Slayer guitarist recently. So sad. One of the things I like best about AA is the fact that when you take away all the outside layers, we’re all the same – a bunch of drunks sitting around telling our stories. One of the few places (if the only) where that happens. Have a good weekend! Thank you for sharing!! I remember her! That show is one of my guilty pleasures! 🙂 sad to hear but glad she is telling her story and got the help she needed. Inpatient saved my life and no shame in that. We need more celebrities like her to speak out! It can help erase the stigma and save so many. Like Paul said- we are them and they are us. So well put Paul! Hey, we all have to have some guilty pleasures, right?! I remember when I first got sober doing a search for sober celebrities. I think I just needed to know that other people (even famous people) had the same issues as me. For some reason, it made me feel not quite as alone. Hope you’re having a great weekend! She’s brave to tell her story. You make a good point that someone may hear her story and think, “If she can be an alcoholic, maybe I am too.” I remember thinking that people like me couldn’t be alcoholics because I didn’t look like I belonged on an episode of Intervention. The truth is, alcoholism doesn’t look the same on everyone. I’m going to have to find this issue so that I can read the article! She is brave – we’re all brave! Admitting I was an alcoholic was one of the hardest things I’ve ever had to do. I think a lot of it stemmed from what you said – not believing that people like “us” could be alcoholics. I don’t want to say I’m proud to be an alcoholic, because I’m not, but I’m proud of the fact that we can talk about it and not hide behind it. Btw, loved your open letter to Heather! Thanks for sharing this, I vaguely remember her as well, and I couldn’t agree more… it takes such courage to open up about this subject, I can’t imagine how much more courageous you need to be to do it on such a public platform! Love reading your blog!